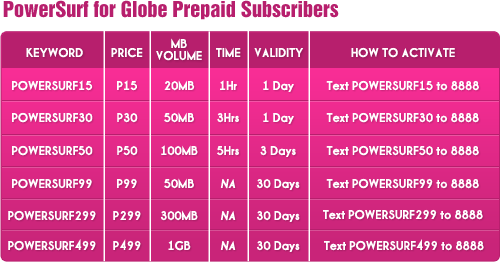 Powersurf prepaid plan from Globe offers per MB data charging when browsing the internet using your mobile. Lot of us wants to stay updated with our social friends from Facebook, Twitter, YM and other social networking sites. Powersurf can handle your needs without worrying high data charges and standard online time cost. 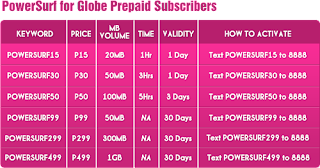 Globe Powersurf is worry free mobile browsing promo as it uses per megabytes or MB charging, with your P15 you can have 20MB valid for 1 day using POWERSURF15. Per MB charging is more applicable on posting status, tweets, sending emails and downloading light apps as this doesn’t consume a higher MB. If you want to know more about this offer, continue reading below on how to register and avail Powersurf. How to STOP POWERSURF or Unsubscribe To Globe Surf, Unli Call and Text Promos. I registered Powersurf99 because I thought it will end until 30 days as I want to keep online on skype via android phone. On my 2nd day of surfing, downloading.. chatting on skype I noticed that my subscription was end and didn't reach the 30 days period. I still have 50 pesos worth of load on my prepaid account. Why this happened? Because your data subscription have already been consumed. For Powersurf99, you can only use up to 50mb of internet access, that means that your skype, downloads, and surfing already reached the maximum MB of use. Take note that watching videos eats a lot of MB. which is better TIME or MB??? ano po dapat eregister sa globe para magamit ko yung skype dito sa phone ko..?